We promise to respond within 4 business hours (AEST). Thank you for choosing to make an enquiry with Fuseco. However, due to agreements with our suppliers we are unable to sell outside of Australia and New Zealand. You will receive $100 off your next purchase if we do not reply within 4 business hours (AEST). All orders are shipped same day! In most cases your order arrives the next business day. If you find a cheaper advertised price for an identical item, we will beat that price by 10%! How it works. Questions related to our service are presented here. We'd love to hear from you! At Fuseco, rather than publish generic prices, we prefer to give you an individual quote. This ensures that we provide you with the best possible pricing to meet your needs. The quickest way to place an order is to give our customer service team a call or send us an email. We promise to respond within 4 hours or you get $100 off your next order, however we usually respond within 1-2 hours to email enquiries. So go ahead and speak to us, we'd love to help you with your needs. What are our delivery terms? Additional fees may apply for remote areas. How do you properly select fuses? Fuses shall be selected according to the following criteria. Maximum operational voltage – shall be equal or greater than the system operating voltage. Rated breaking capacity – shall be equal to or greater than the maximum fault current expected in the circuit downstream the fuse. Rated current – shall be equal to or greater than the continuous operating current of the circuit protected by the fuse. Breaking range – partial range or full range breaking capacity according to the type of protection required. Utilisation category – select according to the nature of equipment to be protected. How do you read the fuse markings? Fuse standard, size and reference. This defines the operating performance and mechanical design of the fuse. Voltage rating. 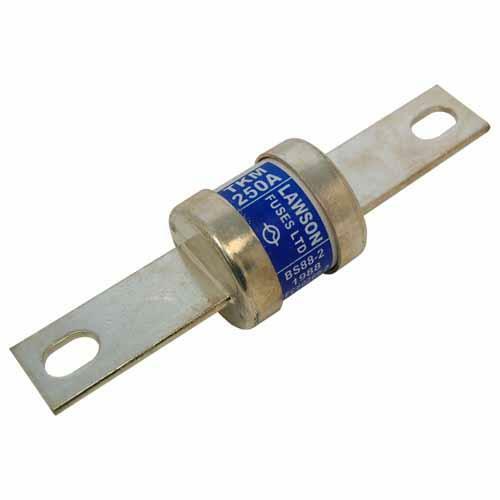 Fuses may be operated up to the maximum voltage stated in the rating. Voltage ratings may be colour coded to reduce the risk of incorrect installation. Current rating. This represents the value of the current that the fuse can carry continuously with out deterioration under specified conditions. Rated breaking capacity. This is the maximum value of prospective current that a fuse is capable of breaking under standard conditions. In other words, the maximum amount of current that a fuse can tolerate without losing its physical integrity (physically breaking apart). Industrial fuses according to IEC 60269-2 have a minimum breaking capacity of A.C. 50kA and D.C 25kA respectively. Breaking range and utilization category are indicated by letter codes. The first (lower case) letter indicates the breaking range, i.e. the range of prospective currents the fuse is able to break. The second (capital) letter indicates the utilization category, i.e. time-current characteristics for typical applications. Manufacturer’s product reference or part number, required for additional information on the fuse. Rated frequency if other than 50 or 60 Hz. Date of manufacture, useful to trace back product design changes. Certification mark, asserting product quality by an independent certification body. Conformity mark, stating conformity to applicable national directives. Recycling mark, identifying responsible recycling organization. How do I identify & replace a blown fuse? In most cases, people contact Fuseco when they need to replace an existing fuse that has blown. In such cases, it is paramount that either the identical fuse or an exact equivalent is provided. Care must be taken to make sure that the fuse provided is of the same utilisation category and has the same electrical performance of the original. If you need assistance with this, I welcome you to contact us and we would be very happy to assist you. Also, we provide many types of cross-reference charts on this website, wall charts and various tools that can assist you to identify equivalent fuse types. What are British Standard fuses? Industrial fuses made to BS88 standards are very popular in countries like England, Australia and South Africa. The industrial versions are characterised by either clip-in tags, offset tags or centre tags. To install them in their holders, the usual practice is to screw the fuse to the inside of the fuse holder wedge which then slides into the holder base. British standards (eg. BS1361) also cover service fuses and J-Type fuses. HRC means high rupturing capacity. Also known as high breaking capacity (HBC) or interrupting capacity. Usually ceramic and measured in kA. Michael, you asked me if I was happy with your service. Let me tell you that Fuseco had quoted and delivered the products via airfreight from Germany before our other suppliers returned our call. Outstanding! It’s been a pleasure working with Fuseco on this project. Initially, we thought that the power quality issues on this job were insurmountable. Fuseco conducted a power quality site audit and consulted with us to find a suitable solution that would work reliably in this challenging environment. The reactors and harmonic filters specified & supplied by Fuseco have been the perfect solution. Just wanted to say thank you again to the Fuseco team. When presented with an electrical harmonics problem of this nature, I wasn’t sure how to approach it. You guys explained it in logical, scientific terms and expertly demonstrated the capability of your technology. It is now one month post-installation and I can say that the Active Filter is working well and the harmonics levels on this site are now negligible. I would like to acknowledge the exceptional service provided by one of your employees over the Xmas break. On Christmas day we lost a 22kV underground feed to a very important part of our business and were desperate for some replacement HV fuses. I found your emergency contact details on the web a and immediately called. The person who answered was very helpful and arranged an emergency transport to our site. The next day, we were back up and running! We are a remote operation 1800kms from the nearest city and average service is the norm. Thanks for ensuring that our order was delivered on time. Again, thank you for going the extra 8,000 km! I just wanted to let you know what great service your people gave us over the Christmas break and went to great lengths to make sure that we got the right fuses and that they were delivered on time. Dealing with your company a pleasure. Keep up the good work. I don’t normally do this but I feel compelled to thank you in writing. I have been in the electrical industry for 25 years and without a doubt the most competent and trustworthy supplier I have used over this period of time is Fuseco. This is a demanding industry and how your team keeps performing above expectations is exceptional to me. I have dealt with Fuseco for the last 6 years for all our fuse requirements and find they provide the highest quality service and on-going support to our business for our day to day operations and for emergency/ heatwave as they arise. During a heatwave event in January 2014, SA Power Networks had critical fuse demands. Fuseco were extremely responsive in expediting stock requirements and organising special air freights to meet our urgent demands. Their customer service is excellent and key KPI’s measured against the contract are always above target. Any company that can pull a rabbit out of a hat like that definitely has my attention! Our experts are all pre-eminent leaders in electrical products who provide excellent support in their areas of expertise. Our friendly team are highly trained product experts who really enjoy helping customers find what they need. We promise to respond within 4 business hours (AEST) or you will receive $100 off your next purchase. Mon – Fri 8.30am to 5.00pm EST. Monday to Friday between 8.30am to 5.00pm EST.